Warning: If you are someone who makes their living in/around/by ‘social,’ I’m not writing this particular post for you. I am writing for the thousands of sales reps who are being advised to use Twitter to engage with prospects and establish 'thought leadership.' Read on and make up your own mind. I love Twitter. I love the brevity. I love seeing what my friends & colleagues are chatting about. I love getting RTs and favorites and all those things that make me feel so popular and interesting. And then damn Twitter had to give me analytics and allow me to see exactly how engaged my ‘followers’ are with what I’m sharing. Net net: my bubble was burst! At the time of this writing I have ~5K followers. Not a huge number, but not inconsequential. When Twitter released analytics, I took a peek at the data to see what was what. After all, I’m making an investment in curating the best of what I see/read/find and want to know the return. I discovered that while Twitter feels great around activity, it’s less so around engagement. Put more simply -- people may view and RT your stuff, but rarely do they (or anyone else) actually click through and read what you are sharing. Bummer. So by simple math we have: 4870 followers + 2 RTs (assume followers of 1.5K each) = total audience of 7,870. 8 clicks / 7,870 = engagement rate of .1%. Yikes! That knocked me for a little loop, but not enough to make me abandon ship. So…. We decided to take a deeper dive into the data. So I asked Matt to do some digging. He selected 25 twitter accounts to analyze. (Big names in the Sales game with follower counts ranging from 2K to 20K.) He ran an analysis (5 tweets per test subject) and uncovered the following. 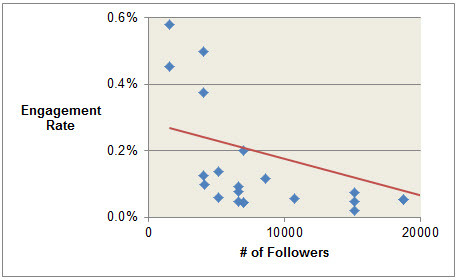 The average per-tweet “engagement” rate is roughly .1-.3% regardless of follower count. These are basically the same rates as display/banner ads. Well, if you are salesperson who wants to become a ‘thought leader’ to your prospects by sharing valuable content and great information, you might want to invest your time elsewhere. Think a Postwire portal. Think LinkedIn updates. Think personal nurture emails. Think sniper rifle as opposed to shot gunning it out there and hoping it gets seen and absorbed. Your average Twitter user sees at most 10-maybe-15% of their total stream. It’s hard to 'engage' with what you don’t see. Twitter can have huge benefits for sales reps.
You will uncover prospects that aren’t in your territory. Share that information internally. You will uncover prospects that are in your territory and talking about topics that make them relevant for you. Bingo – you just got lucky! I still love Twitter and will continue to participate, but my advice for sales reps is to do your own analysis. Calculate your level of activity and your level of engagement. In other words, take a break from all that thought “sharing” to turn around and see if anyone is actually following you in a meaningful way. Based on the data, decide where and how to invest your social time. Thanks for reading. Have you dug into your twitter analytics? Has it changed the way you share?